Capalaba FC has a very successful women's & Junior Female program. In the 2017 Season, we had female teams in U12, U13, U14, 2 x U16s, BWPL, BWPL Reserves, City 1 & 2 and Legends. 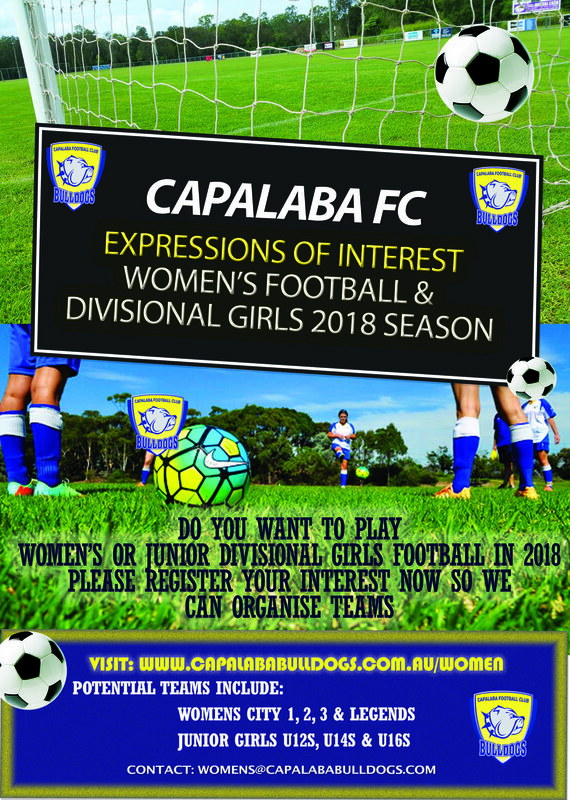 We pride oursleves on our Female culture at the club and for the 2018 season, in addition to our NPL Women's program (U13's, U15's, U17's and Open Women's) we are looking for people to come and join the great female program we are building at Capalaba FC. This is for the regular Football Brisbane competition, due to start in late February or early March. Registering your interest allows us to plan ahead for the season, and also makes it easy for us to contact you if we hold any pre-season open training sessions. It does not lock you in to playing. Pre-Season will be starting early January 2018, so please register NOW! Registrations are for new and existing members. Have a great Christmas & New Years! NPLW Pre-Season Home Games Vs Easts TODAY!